Every wedding day has its few stressful moments, but I can tell you without a doubt, usually the time I see the bride and groom most stressed out is during the formal family portraits. If you haven't experience it first hand, it's easy to imagine... Uncle Ted is in the bathroom when we need him, no one can find Grandpa Jim, and an extended family member you forgot about is asking for a portrait of her whole family, unplanned. The bride and groom simply want to get through the photos as smoothly as possible and go celebrate! With some planning and a little effort, there are ways to make this part of the day much easier and more efficient. The overall takeaway is the more planning you can do ahead of time, the easier it will all be. 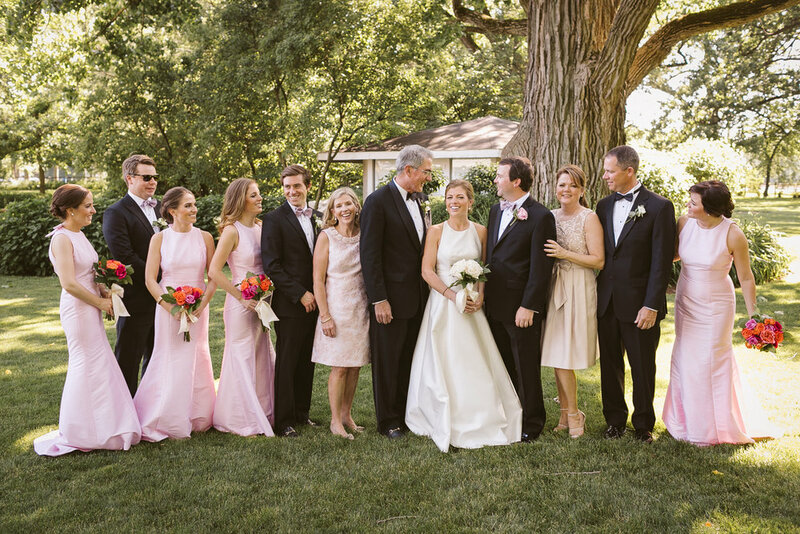 Here are my tips for having family portraits go smoothly on your wedding day! 1. Talk to each other and talk to your family. Have the discussion ahead of time about what family photos are important to you and your immediate family. Make sure you know which family members will need to be a part of this. Maybe a certain family group is very important to your mother and she wants to have a photo of that group with you. Sometimes that will be important to you too and you'll want to accommodate that request. Other times, the schedule might force you to be picky about who is involved in these pictures. Either way, it is much better to have this conversation ahead of time rather than in the moment. 2. Make a detailed list for your photographer. After you've made your detailed list, try to get it to your photographer at least a month in advance. We've done this a time or two and we generally have a good idea of how much time it will take to get certain photographs. We'll be able to tell you if you've budgeted enough time in the schedule to get all the family portraits listed. Depending on the amount of people and shots listed, I say generally you should leave 30min - 1 hour for posed family portraits. 4. Inform your family when/where the portraits will be done. Sometimes this is simple to do before the big day and sometimes not. If not, designate a family member (or multiple) to communicate with all the family members on your list. If we're doing the portraits immediately following the ceremony, ask them beforehand to stick around for family pictures. I can't tell you how many times a grandma has gone on to the reception because she didn't know she needed to stay for family pictures. However it gets accomplished, make sure all the appropriate people know where they need to be and when. 5. Pick a couple go-getters to be your wranglers. Think of your most enthusiastic friends/family members, you know, the ones who get sh*t done. These are the best people to be your wranglers. They will track down any missing family members and get them where they need to be for photos. With organization and order of your list, usually it is easier to start with a big group and then have people step out. For example, starting with the bride, groom, and brides entire extended family... then having extended step out leaving only immediate family, then just parents, and so forth. 7. Strategize with the help of your fabulous photographer. I always offer to meet with my couples at their venue a month or so before their wedding. This allows us to explore the space and scout potential photo locations. Light is a HUGE component of photography and what your images will look like. For most portrait and family photos I love using natural, diffused light. This means not under direct, harsh sunlight where we're likely to get unflattering shadows. Together we can find the perfect spot for your family portraits ahead of time. 8. Bring the focus back to whats important. I always put my couples experience before any specific shot. This is one of the happiest and most important days in your life. To me, the most important thing is that you have the best day possible and fully experience all the joy and love. So my advice and my hope for you on your wedding day, is that whenever you feel yourself stressing or worrying about some aspect of the day, try to bring the focus back to what is truly important. You are marrying your best friend, your better half, the person who is going to help you live your best life. So as long as that is still happening, does everything need to go exactly according to plan? The truth is it won't. No matter how much planning, something is bound to not be exactly what you thought it would be. I hope that you do not let these little things impact your happiness on one of the most joyous days of your life. And I promise to be there with you all day, reassuring you, everything is ok, in fact everything is great. Because you found your partner for life. In a nutshell, plan as much as you can beforehand. But when inevitably something doesn't go quite right, you can feel confident that it will be ok. You hired a professional that has dealt with it all and will find a way to get the photographs that are important to you no matter what. Kate Kaplan is a Wedding Photographer working in the greater Chicagoland area. Get in touch!